Attempting to make a silk purse out of a proverbial sow's ear, the author and the volume's contributors envision, either realistically or ironically, how building a wall on the U.S.- Mexican border could be artistically or environmentally pleasing, leaving aside ethical questions of migrants' rights or even how such a wall would be anything but a glaring insult to those living south of it. When Donald Trump pledged, during his presidential campaign, to ‘begin building a wall’ along the US-Mexican border he was promising to create something that already existed. At the time, more than one third of the border was fortified, in some parts with a single wall, elsewhere with two or even three layers. Work had begun on a deterrent barrier during Bill Clinton’s presidency, but it was limited and ineffectual: the border is roughly 2000 miles in total, Clinton’s wall covered 325. In 2006, under Bush II, Congress approved a plan to extend the defence: the Senate wanted 370 miles, the House roughly double. The New York Times was quick to play to the mood in Washington and proposed a troubling parlour game, inviting a handful of architects to design the Congressional project as a neighbourly fence that made the most of its unattractive character, often by pretending it had nothing to do with exclusion. The fence, the New York Times said, could be reconceived as ‘a horizon of opportunity, not as a barrier’. Hundreds lose their lives every year trying to cross into the US, and numbers have risen as fortification forces many migrants into the Arizona desert – which US logisticians have seen as a natural deterrent – to die of hypothermia or dehydration. And so the Times experiment was not unlike Stanley Milgram’s famous work on torture and obedience at Yale in the early 1960s. Guest architects were being asked into the laboratory, and nudged over an ethical boundary without knowing it. (Perhaps the Times didn’t know it either.) How far were they prepared to go by turning the idea of an exclusionary frontier between Global North and Global South into a career opportunity? Five of the 13 invited submitted entries, including an exquisite ‘glass forest’ by Eric Owen Moss, a practice in Culver City, LA. The most sinister submission was from Antoine Predock, a practice in Albuquerque, which proposed to ‘dematerialise’ the wall in a slick, quasi-illusion that caught the dying spirit of postmodernism: Predock would erect a fortification of rammed earth, to be built by Mexican day labourers. There would also be a vast hotplate: the shimmering air above the plate would create a mirage effect, making the earthwork appear to lift off the ground; but the hotplate would also act as a deterrent, scorching the feet of unauthorised migrants. Predock’s portfolio was worthy of the Deutscher Nationalpreis für Kunst und Wissenschaft, the Nazi alternative to the Nobel award. One of Hitler’s cherished winners in 1938 was the Autobahn whizz, Fritz Todt. Todt also oversaw the Reich’s western military defence known as the Westwall, which ran from the border with the Netherlands to the border with Switzerland. In his ‘manifesto for the US-Mexico boundary’ Ronald Rael, a professor at Berkeley, takes the border as a site of potential renegotiation and reimagining. Rael and his four contributors would rather the border didn’t exist, but they’re not about to pretend it doesn’t. They approach it in oblique ways, often introducing absurd, pseudo-utopian schemes that point up its dystopian character. Some of their ideas are pointedly ironic. They suggest, for example, a series of see-saws – ‘teeter-totters’ – with fulcrums installed along the wall, children rising on one side as their unknown playmates descend on the other. The more absurd the tweaks they suggest, the more arbitrary and hostile the project of border fortification begins to look. Rael praises a risky, revisionist essay by the American architect Lebbeus Woods on Israel’s separation wall published in 2004. It presupposes that Israel has reconsidered its position, decided not to complete the wall, and that architects and builders on both sides are producing a welter of add-on features, alternative uses and elaborations for the finished parts which – in Rael’s paraphrase – ‘eventually force it into an imbalance that theoretically topples the wall’. 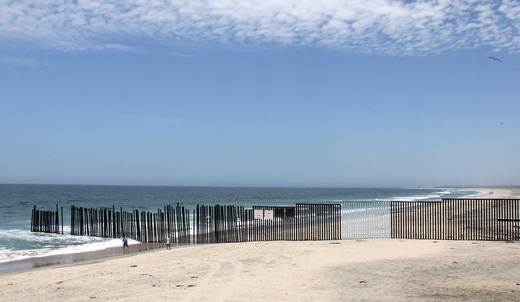 A section of the US-Mexico border painted pale blue by Ana Teresa Fernández. ‘Eventually’ and ‘theoretically’ are weasel words for Palestinians, intruders on their own land, displaced by state-creation and – on the West Bank – living under military occupation and settler colonialism, which have lasted half a century. Unauthorised persons trying to enter the US from Mexico and from countries further south, intrude in a more straightforward way, even if we see what drives them and grasp the terrible risks they face. So Rael’s question is a good one: ‘Does refusing to participate in the design of the wall make architects any less complicit … than participating?’ He seems to say that it doesn’t, yet some of his projects damn the border by their preposterousness and, as a result, we can’t always read the tone of his essay, or judge the seriousness of the ‘concept drawings’. This is deliberate, I guess, and an advantage in a book about borders: a border, after all, confiscates most kinds of ambiguity; it takes itself literally and performs to narrow specifications, just as we do when we cross it. Among Rael’s stranger suggestions is a plan for confessional booths along the border, in which priests on one side could minister to penitents on the other: the booths would be ensconced in the wall in such a way that priest and penitent would be on foreign soil as they transacted the rite. Another is for ‘binational horse-racing’ either side of a wire-mesh section of fencing. It’s quickly obvious that both ideas are prompted by real stories that have unfolded at the border, which is a constant catalyst for ingenuity and perversity. The first pays homage to the work of a US Methodist priest in San Diego who, in 2008, began administering the host through the mesh every Sunday to communicants in Mexico. (Increasingly, Rael writes, such radical pastoral work by North American Christians is seen as civil disobedience.) The second commemorates a story from the 1950s about a famous chestnut racehorse called Relámpago, born in the US but owned by a stable in Mexico. The horse had many challengers, and eventually it was agreed that he should race against a former Kentucky Derby runner stabled in Pirtleville, in Arizona. As the day drew nearer, a foot-and-mouth outbreak made it impossible for either horse to be brought across the border. In those days the border fence at Douglas was not much higher than a sheep fence, and so the race went ahead in the autumn of 1958, with Relámpago running in Mexico and his contender in the US, either side of the fence, both plainly visible to spectators, wherever they happened to be. After a bad start, Relámpago edged ahead to win. Rael’s border tales, and his list of transgressive breachings, include the propulsion in 2005 of a human cannonball, David Smith Sr, from Tijuana, Mexico over the wall and into a safety net in San Diego, California, an open-air circus act that shot him maybe sixty metres. Smith’s stunt was not an immigration offence: he’d obtained permission from US Border Patrol. He made a point of brandishing his US passport to exhilarated crowds in Tijuana before he slid into the cannon that lofted him back into his own country. Rael uses the story to tell a larger one, about the dispatch of packaged marijuana and cocaine from Mexico by trebuchet and pressurised air cannon, powered like survival packs into a beleaguered enclave. North American cities would be restive, insurrectionary spaces without these deliveries from the cartels: some of their engines can deliver 14 kg of drugs per shot. Rael has more earnest thoughts about the US-Mexican border. Some, like a ‘linear urban park’ for cyclists and pedestrians, are health and leisure projects for well-toned, outdoorsy North Americans. Others depend on sound Californian intuitions about resource scarcity and ecological threat: Rael has projects for massive solar energy capture, water collection and the regeneration of border rivers. He is in favour of natural barriers and suggests walls of cacti, rather than steel, as a disincentive for adventurous migrants trying to cross the Organ Pipe Cactus National Monument, a vast tract of landscape (also a Unesco biosphere reserve) in Arizona. When he sticks on his collar and tie in this way, Rael resembles the influential border geographer Julian Minghi, who wrote a famously upbeat piece after the Berlin Wall came down about the future of ‘boundary studies’, announcing a new focus on the ‘normal and harmonious contexts’ that were sure to prevail in a changing era for human geography. Since that essay appeared, at least 35,000 people – according to the International Organisation for Migration – have died trying to cross a frontier, most at Europe’s external border, but more than six thousand at the US/Mexico border. These figures, almost certainly too low, are growing in proportion as border vigilance becomes a priority, with larger deployments of guards and more generous budgets. In Frontier on the Rio Grande (1982), another geographer, John W. House, explained that the US Border Patrol in the 1970s was ‘derisorily small’: 1350 personnel (including teams looking out for ‘Chinese travelling on foot’). There are now 21,000 Border Patrol agents, large numbers of them posted along or near the frontier. 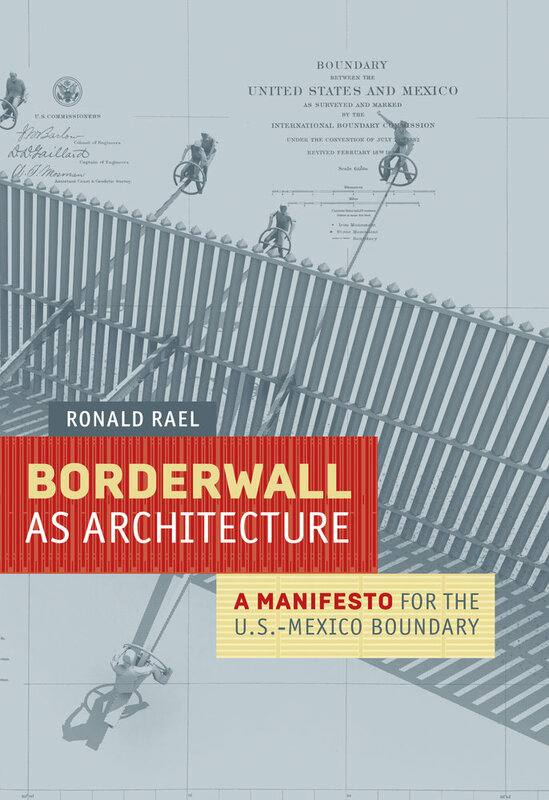 House, unlike Minghi and Rael, was a realist: he defined the US/Mexican border as ‘a clear but variable impediment to an otherwise unified binational labour market’. And so it remains. There are obvious questions for Rael. Why does he find a plant barrier – a thick stand of cacti – more acceptable than a built obstacle intended to deter migrants from crossing a dangerous stretch of land like the Organ Pipe Cactus National Monument? Why is a piece of managed nature that would tear them to shreds any better than Predock’s elegant plan to fry their feet with a hotplate? The answer, surely, is that scholars like Rael in ‘receiver’ countries now accept that the militarised frontier is here for the duration and think the best option is to bury the shame of global inequality in a discourse of remedial greening, healthy cycling paths, solar energy and river stewardship, designed to mitigate the carbon footprint, and obscure the moral footprint, of the prosperous economies to which migrants aspire. Freedom of movement across borders is now an inimical idea in the US (as in Europe). Activist movements along the Mexico border, theorists of borderlessness, and extreme market-liberal advocates of deregulated migration have failed to win the case: the ‘wall’ is the will of the people, apparently, and the people have spoken. Rael is loath to shrug his shoulders and disengage. And he is genuinely concerned to create spaces in which people from both sides of the border can interact. He cites the example of Friendship Park in San Diego County, where people living on both sides of the border have been able to mingle for a few hours ever since border regulation came into existence in 1924. But Friendship Park, as he says, is now an enclosed space between two high walls, with a maximum of 25 Mexicans allowed in at a time, and then at weekends only, between 10 a.m. and 2 p.m. In the end, Rael’s courageous mixture of subversion and compromise is not going to hide the affront that the border represents to those who live south of it. In her contribution to this book, Norma Iglesias-Prieto writes: ‘It is an object that, from Mexico, alludes to an apparent double standard,’ with the US trying to impede the movement of ‘illegals’ while reaping ‘the benefits of a cheap and vulnerable labour force’. She is thinking mostly about the grim sections of metal fence around Tijuana and San Diego, but whatever materials are used to complete a ‘secure fence’, it will still be a provocation. Artists’ responses to fortified barriers leave them less open to the charge of collusion than architects and designers. The Palestinian artist Khaled Jarrar has done striking pieces on Israel’s separation wall, including a video of a mother and daughter communicating – almost managing to hold hands – through the barrier. He has chipped and drilled concrete from the wall and used it in sculptures (one of the most memorable is the stump of an olive tree, half wood, half concrete). Last year he removed a metal post from the border wall in Tijuana, cut and welded it into a ladder and showed it as an installation in Juárez. Ana Teresa Fernández, a Mexican artist living in the US, has painted bits of the wall with camouflage colours – mostly sky-blue – to create the illusion that a section has been removed. From a distance her trompe l’oeil gaps in the wall invite you to saunter through. Who can object to plans to reverse the ecological damage, build a binational movie theatre, or more passageways for local wildlife? But a wall is a wall, whether it’s rough and ugly, like its most powerful advocate, or kitted out as something other than itself. Author Ronald Rael is associate professor in the departments of Architecture and Art Practice at the University of California, Berkeley. He is the author of Earth Architecture, a history of building with earth in the modern era that exemplifies new, creative uses of the oldest building material on the planet. The Museum of Modern Art and the Cooper Hewitt Smithsonian Design Museum have recognized his work, and in 2014 his creative practice, Rael San Fratello, was named an Emerging Voice by the Architectural League of New York.